A stay in the Heartstone Inn will steal your heart away! The creme brulee french toast for breakfast is one that will be memoriable for some time to come. I bought their cookbook and get raves everytime I have my own B&B for visiting friends in Little Rock where I live. The outdoor deck is terrific for sipping wine or lemonade-they provide homemade chocolate chip cookies. I wouldn't stay anywhere else when I visit Eureka Springs!! They have the MOST delightful shop right next door filled with country french goodies. The innkeepers couldn't be more friendly and have an incrediable walk to share if you want to do a short hike to downtown...past picturesque gardens/sculptures/boutique shops. You'll think you're in the Alps...!! We have stayed in many B&B's across the country and this is one of our top favorites. It's difficult to rate in the proper order... Food, Rooms, Service, Cleanliness - All top notch! We stayed 3 nights and were treated to a breakfast surprise each morning - creme brulee french toast was something I had never imagined and it was delicious, with fresh fruit and muffins, and country sausage, and bottomless cups of coffee and juice. 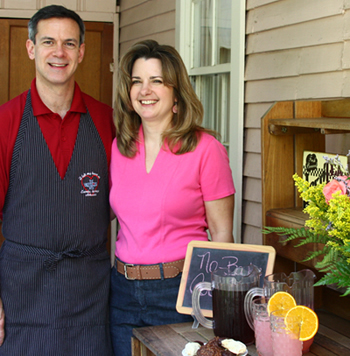 The owners, Rick and Cheri, are so friendly and accommodating without being invasive. We truly enjoyed their company. The property and rooms are immaculate, yet so comfortable. Big comfy beds and high thread count linens; we enjoyed the 2 person jacuzzi tub every day - nice for relaxing at the end of a busy vacation day. The property itself is quietly secluded against a hill and we were surprised at the variety of wildlife that came through while we were relaxing on the huge deck - deer, red-headed woodpeckers, blue jays, and swarms of hummingbirds. We really like the outdoor access to each of the rooms - it's very private and there's no 'curfew' or feeling like you're sneaking home if you stay out late! The Heartstone is home when we're in Eureka Springs. We look forward to staying in each of the rooms and maybe the cottage next time! Rick and Cheri were wonderful. Breakfast was huge and tasted wonderful. They were very helpful pointing us to good shopping, dining, etc. The room was cozy and clean. It's in a good location too. We would definetly stay here again. Quick girlfriend trip to the Heartstone Inn. Loved it! We each had massages and loved that it was on the property of the B&B and just walked a few steps to our cottage. The breakfast is OUTSTANDING and so much food that you won't need to eat until dinner. Great service and very clean. Beautiful parlor, enchanting grounds, and comfortable, immaculate clean rooms. Beyond delicious breakfasts. Any and all requests were met with a smile. Will definitely stay here again! Lovely inn hosted by the two most charming people who not only make you feel special but cater to your every whim. Will certainly tell all our friends to put this inn on their special places to stay. I just returned home after spending 3 nights at Heartstone Inn and it was fantastic. The food was the best I have ever had and I would rate this Inn in the top 5%. I have stayed at B&B's throughout the world and this has been one of the best. The rooms are decorated beautiful and the service outstanding. If you are in the Ozarks, this Inn is a "must". What a great B&B to just sit back and relax. We especially love The Victoria House!! It even has a fainting couch!! Rick's breakfast is always delicious and different every day!! Sherry has wonderful treats every afternoon -- and they are different daily!! We love having two bathrooms for the two bedroom house and love having a living room where comfort away from home is the word!! Eureka Springs also has delicious restaurants!! So even though there is a kitchen at the house it was never used! Thanks Rick & Sherry for making our Labor Day vacation so wonderful!! Innsider, Arkansas Times, New York Times, Arkansas Gazette, Southern Living, Country Home, Country Inns, USA Today.